Pain After An Ankle Sprain Did you sprain your ankle from playing a sport or running? 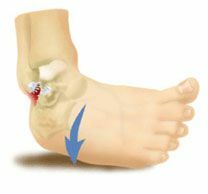 If you were treated but still have pain it may be caused by a condition called peroneal tendonitis. As you’re engaging in the fun activities during the holiday weekend, here are some signs to be aware of if you think you sprained your ankle. With most ankle sprains, you will feel the pain right away. The ankle will start to swell immediately and you will most likely see bruising. Unfortunately, it will hurt and the ankle area will usually be tender to the touch. If the injury is really severe you will hear and/or feel something tear, along with a pop or snap. If this is the case, you will be unable to walk. The more severe your ankle sprain is, the longer it will take to heal.The longer you wait to have your ankle treated the more likely you are to experience more serious problems such as long term joint pain and weakness. We often hear that people tried to "walk it off" or thought the pain would "go away". If you are experiencing bruising, swelling and pain- you need to see a doctor! Podiatrists are trained ankle doctors and surgeons. They are able to handle the full scope of a sprained ankle. Many podiatry offices offer digital x-rays and ultrasound. Your podiatrist will be able to diagnose the severity of the ankle sprains and begin a treatment plan. Podiatry offices usually offer crutches to leave with, as well as, ankle and foot support boots. In the instance of a very severe sprained ankle, most podiatrists will be able to perform surgery. At Family Foot & Ankle Specialists, we understand that injuries like a sprained ankle can be sudden and painful which is why we have 24 hour emergency care! Don’t wait to have your sprained ankle treated. If you are having any of the above symptoms, please do not hesitate to give us a call.